I am taking a wee break for what will be a short post this week. I have been winding lots of warps this week and don’t want to break the rhythm too much. As I settle down to wind warps, opportunities to experiment and learn come my way. This week I learned more about corrugation in plain weave when using cotton. Warping is just one part of the preparation process and I have been warping a lot of narrow bands with cotton. This has given me the opportunity, with the added benefit of repetition on many many examples, to contemplate that pesky ridging problem that we often experience when using cotton and weaving plain weave. You may have had this happen yourself. Your plain weaving looks like a piece of corrugated board…Above, you can see an extreme example on a warp I was using to show supplementary-weft patterning. See how the woven plain-weave part is ridged? The ridging is all the way across the band. I won’t call it ugly as many people have told me that it happens to them and that they really like the effect. I guess it just bugs me because I can’t control and predict it. Sometimes it happens and other times it doesn’t. But I definitely prefer my weaving without it. Well, it seems that it is the different movement of the warps around the far loom bar as I open each of the two sheds that is the main culprit for this irregularity in the two sheds causing the warps in one shed to buckle and ridge up while the warps in the other shed don’t. I didn’t get any ridging in my two scarf experiments which were woven in plain weave with supplementary-weft patterns and I know why. The black scarf was woven using a warp in a single plane and the purple one was woven in a circular form and then cut apart. My design choices for the black one changed so often and I had to unweave so much that the first part of the warp started looking rather sad and worn. So, after the third attempt to get something with which I was happy, I left a couple of inches woven with the abandoned pattern (there was a little bit of ridging) and turned the loom around and started weaving from the other end. The woven part at the far end of the loom secured the warps so that there was no warp slippage or sliding when I opened the sheds. Result: nice smooth flat even cloth…not a ridge in sight! I did the same on the practice piece below, that is, I wove from the wrong end first before turning the warp around and weaving from the good end. 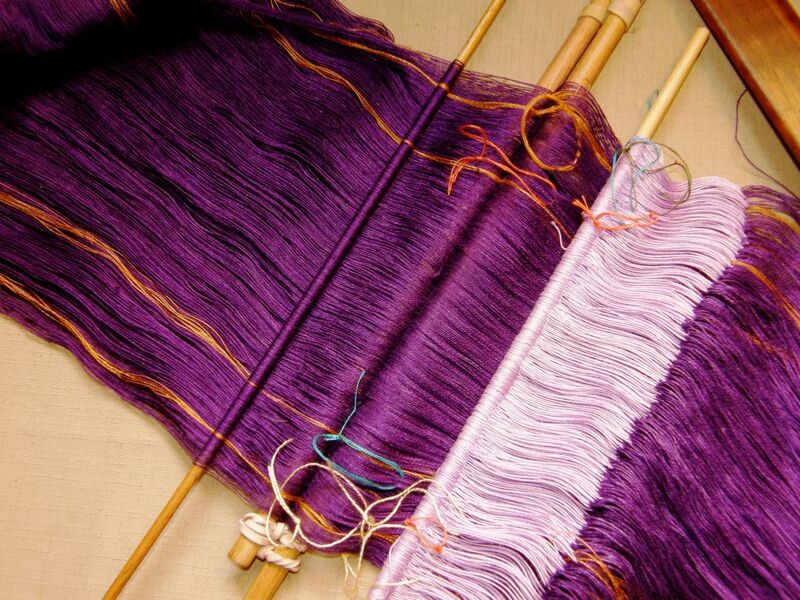 The coil rod performed the same task on the purple warp. It held all the warps in a tight grip so that they couldn’t slide any signifcant amount when the sheds were opened. 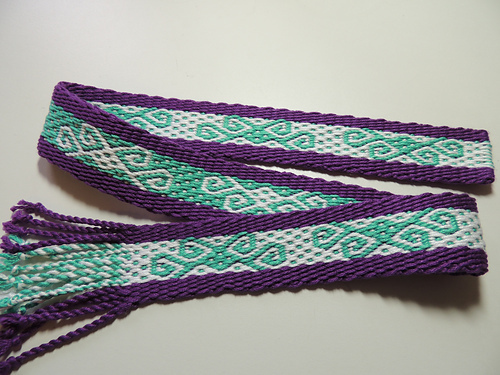 However, I am sure that if I try ikat using the coil rod, I will see that there is, in fact, slight movement. 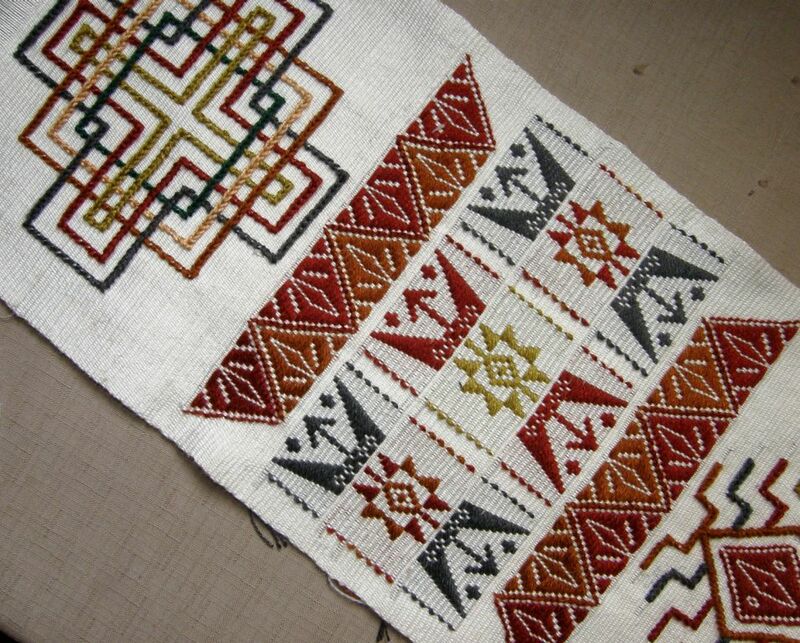 The warps forming the ikat pattern will start to become mis-aligned and the motif will blur. 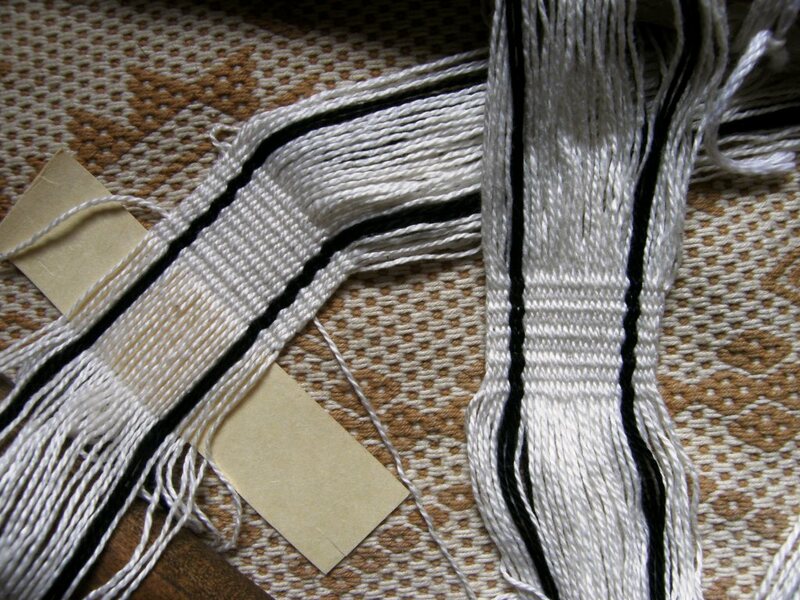 In the same way, when I wove some ikat experiments last year, there was no ridging because I left the wraps on the warp and they held the warps tight and stopped them from slipping….just enough to prevent ridging but not quite enough to eliminate blurring of the motif. But that’s okay.. blurring is the charm of ikat, right? At the time I was covinced that the fact that I was using a vey fine weft had solved the ridging problem but now I think otherwise. Why has it taken me so long to get a grip on this? I think it’s because I very rarely do just plain weave. I spend a lot of time doing pick-up with warp float structures where the ridging problem does not occur. Lately, with my renewed interest in supplementary-weft patterning I find myself doing a lot more plain weave in larger and more ambitious projects. My teachers in Guatemala weave plain weave in cotton and they always weave a little at the far end of the warp before turning the loom around and starting the real weaving. The answer was there in front of my eyes and I didn’t see it! So, below, I can show you one of the warp samples I have been preparing. I first wove from what I call the “wrong” end of the warp….the end with the knots. I did this to lock the warps into place. Then I turned the warp around and started weaving from the “right” end. The weaving from the wrong end is ridged…nothing too extreme, but it is there. The right end is clear. The good thing is that I have woven MANY such samples to put this to a thorough test…. (And, occasionally, I weave at the wrong end and it doesn’t ridge. I have yet to figure out what I am doing differently to cause that to happen). This was not easy to capture in a picture. 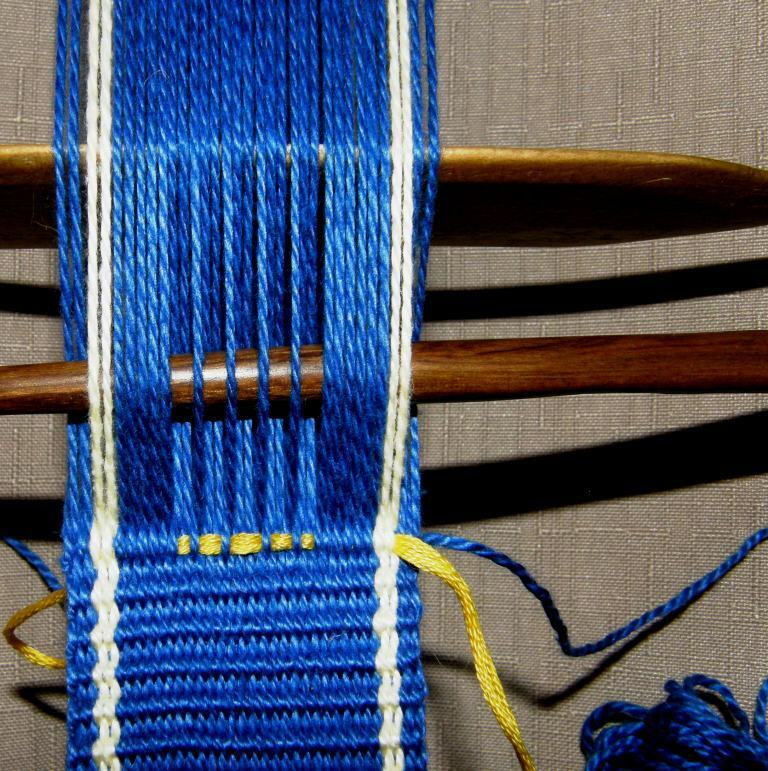 This is two ends of the same warp. I hope that you can see the difference…on the right, ridged…on the left, not. So, that’s what I have been up to this week. Like I said, this is just a short post. To end, I have the most wonderful projects to show you from online weaving friends and from one friend who wove with me last year. Seeing these puts the biggest smile on my face. I am up off the floor now and warping on a table standing up. I can even do a little dance while I am at it. Here is a sweet pebble weave band from CindyQ . I love the color combination and it is so well woven! She is using the thick border that I describe in my book Andean Pebble Weave and the pattern is my adaptation to pebble weave of a Central Asian motif which appears in the follow-up book More Adventures with Warp-faced Pick-up Patterns. I know CindyQ from Ravelry and we will get to meet at ANWG in June. This is from Laura who wove with me last fall. Now she is studying double weave. The “dog chasing squirrel” design is her own. I love it! 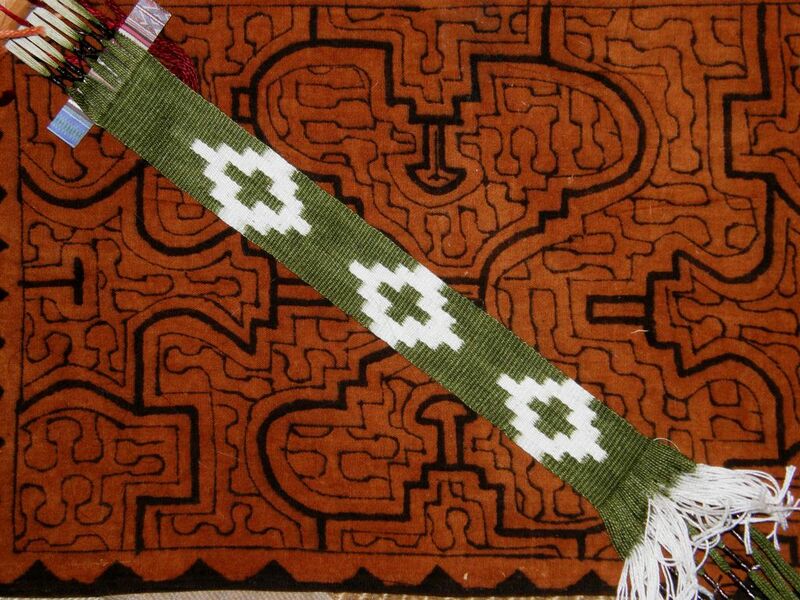 The birds are from Double Woven Treasures of Old Peru, Cahlander and Baizerman. This is my first attempt at a wider pebble weave project in finer yarn. 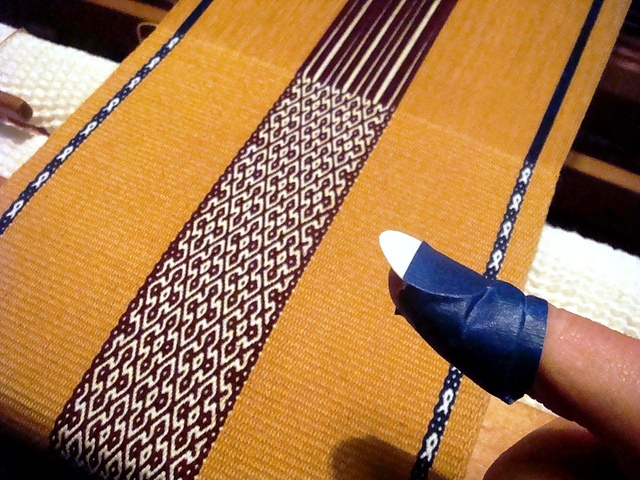 The pattern is taken from a Sashiko (traditional Japanese stitching) pattern and is a variation on several patterns called “Well Curb”. Early on I was making lots of mistakes. I finally divided the pattern into sections and as I completed the picking of a section I placed a chopstick within. This way I could check my work more easily as I went along. The mistakes gradually decreased. Isn’t that spectacular? She is also showing her unique pick-up tool. I wish I had taken a picture of the length of my thumbnails when I was making my scarves. They really did help with separating the fine threads (they were horrendous-looking, to tell the truth!, but very nifty). I guess I met Julia here on the blog but we also know each other on Ravelry. I am thrilled that we will get to meet in person in June. In my second book I have included tutorials on how to chart pebble weave designs directly from woven examples and then go on to show how to create your own patterns from your head or from other inspiring textiles as Julia has done. It is all about “connecting the dots”. (Please be aware that my second book was written as a follow-up to the first and does not stand alone as a pebble weave how-to). So, that’s enough break…back to the warping board and loom for me and let’s see what else I can learn while I am at it! regarding the ridges, i have noticed it too occasionally, i thought its due to the angle of my beating, but i think it must have some thing to do with the direction of the spin, it’s definitely a curious phenomena , the less drape of the fiber the more chance for a ridge. keep us posted . love that post, and looking forward to see you soon . How fortunate we all are to benefit from your artistry, craftswomanship, weaving skills and the generous spirit with which you share! Thank you! At last the answer the question! It’s nice to have figured this out finally. We have had many discussions and theories about this, haven’t we. I can’t wait to give it try. Agree with Bobbie – finally! An answer to our ridging woes! Must also try it out soon…..